Dr. Subir Nagdas completed his MS from Calcutta University, India and then received his PhD from Jadavpur University, India. His expertise is in protein chemistry. He served as a Research Associate in Vanderbilt University, Tennessee. 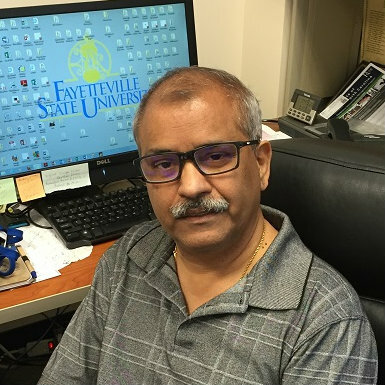 Presently he is a Professor in the Department of Chemistry and Physics at Fayetteville State University, North Carolina, United States. 1. Nagdas SK, Smith L, Medina-Ortiz I, Hernandez-Encarnacion L, Raychoudhury S. Identification of bovine sperm acrosomal proteins that interact with a 32-kDa acrosomal matrix protein. Mol Cell Biochem. 2016 Mar;414(1-2):153-69. doi: 10.1007/s11010-016-2668-3. Epub 2016 Feb 20. PubMed PMID: 26897631; PubMed Central PMCID: PMC4777636. 2. Nagdas SK, Smith L, Mcnamara A, Hernandez-Encarnacion L, Medina-Ortiz I. Identification and characterization of a bovine sperm acrosomal matrix protein and its mechanism of interaction with acrosomal hydrolases. Mol Cell Biochem. 2015 Dec;410(1-2):11-23. doi: 10.1007/s11010-015-2534-8. Epub 2015 Aug 13. PubMed PMID: 26268136; PubMed Central PMCID: PMC4630121. 3. Nagdas SK, Buchanan T, Raychoudhury S. Identification of peroxiredoxin-5 in bovine cauda epididymal sperm. Mol Cell Biochem. 2014 Feb;387(1-2):113-21. doi: 10.1007/s11010-013-1876-3. Epub 2013 Nov 2. PubMed PMID: 24186847; PubMed Central PMCID: PMC3909522. 4. Nagdas SK, McLean EL, Richardson LP, Raychoudhury S. Identification and Characterization of TEX101 in Bovine Epididymal Spermatozoa. Biochem Res Int. 2014;2014:573293. doi: 10.1155/2014/573293. Epub 2014 Apr 10. PubMed PMID: 24818024; PubMed Central PMCID: PMC4003772. 5. Nagdas SK, Buchanan T, McCaskill S, Mackey J, Alvarez GE, Raychoudhury S. Isolation of a calcium-binding protein of the acrosomal membrane of bovine spermatozoa. Int J Biochem Cell Biol. 2013 Apr;45(4):876-84. doi: 10.1016/j.biocel.2013.01.016. Epub 2013 Jan 29. PubMed PMID: 23376657; PubMed Central PMCID: PMC3721343. 6. Nagdas SK, Hamilton SL, Raychoudhury S. Identification of acrosomal matrix-specific hydrolases binding proteins of bovine cauda epididymal spermatozoa. J Androl. 2010 Mar-Apr;31(2):177-87. doi: 10.2164/jandrol.108.007146. Epub 2009 May 28. PubMed PMID: 19478333. 7. Chatterjee M, Das P, Mazumder A, Nagdas SK, Sen PC. Localization and expression of a 70 kDa protein in goat spermatozoa having Na(+),K(+)-ATPase inhibitory and arylsulphatase A activities. Mol Cell Biochem. 2009 Jan;321(1-2):85-94. doi: 10.1007/s11010-008-9922-2. Epub 2008 Sep 27. PubMed PMID: 18820837. 8. Samanta B, Nagdas SK, Das K, Sen PC. Protein kinase catalytic subunit (PKAcat) from bovine lens: purification, characterization and phosphorylation of lens crystallins. Mol Cell Biochem. 2007 Oct;304(1-2):155-65. Epub 2007 May 25. PubMed PMID: 17530190. 9. Olson GE, Winfrey VP, Nagdas SK, Hill KE, Burk RF. Apolipoprotein E receptor-2 (ApoER2) mediates selenium uptake from selenoprotein P by the mouse testis. J Biol Chem. 2007 Apr 20;282(16):12290-7. Epub 2007 Feb 21. PubMed PMID: 17314095. 10. Melner MH, Haas AL, Klein JM, Brash AR, Boeglin WE, Nagdas SK, Winfrey VP, Olson GE. Demonstration of ubiquitin thiolester formation of UBE2Q2 (UBCi), a novel ubiquitin-conjugating enzyme with implantation site-specific expression. Biol Reprod. 2006 Sep;75(3):395-406. Epub 2006 Jun 7. PubMed PMID: 16760379. 11. Nagdas SK, Winfrey VP, Olson GE. Identification of a hamster sperm 26-kilodalton dehydrogenase/reductase that is exclusively localized to the mitochondria of the flagellum. Biol Reprod. 2006 Aug;75(2):197-202. Epub 2006 May 10. PubMed PMID: 16687646. 12. Olson GE, Winfrey VP, Nagdas SK, Hill KE, Burk RF. Selenoprotein P is required for mouse sperm development. Biol Reprod. 2005 Jul;73(1):201-11. Epub 2005 Mar 2. PubMed PMID: 15744015. 13. Nagdas SK, Winfrey VP, Olson GE. Tyrosine phosphorylation generates multiple isoforms of the mitochondrial capsule protein, phospholipid hydroperoxide glutathione peroxidase (PHGPx), during hamster sperm capacitation. Biol Reprod. 2005 Jan;72(1):164-71. Epub 2004 Sep 22. PubMed PMID: 15385412. 14. Olson GE, Winfrey VP, NagDas SK, Melner MH. Region-specific expression and secretion of the fibrinogen-related protein, fgl2, by epithelial cells of the hamster epididymis and its role in disposal of defective spermatozoa. J Biol Chem. 2004 Dec 3;279(49):51266-74. Epub 2004 Sep 17. PubMed PMID: 15377663. 15. Olson GE, Winfrey VP, Bi M, Hardy DM, NagDas SK. Zonadhesin assembly into the hamster sperm acrosomal matrix occurs by distinct targeting strategies during spermiogenesis and maturation in the epididymis. Biol Reprod. 2004 Oct;71(4):1128-34. Epub 2004 Jun 2. PubMed PMID: 15175237. 16. Olson GE, Winfrey VP, Nagdas SK. Structural modification of the hamster sperm acrosome during posttesticular development in the epididymis. Microsc Res Tech. 2003 May 1;61(1):46-55. PubMed PMID: 12672122. 17. Feltus FA, Kovacs WJ, Nicholson W, Silva CM, Nagdas SK, Ducharme NA, Melner MH. Epidermal growth factor increases cortisol production and type II 3 beta-hydroxysteroid dehydrogenase/Delta(5)-Delta(4)-isomerase expression in human adrenocortical carcinoma cells: evidence for a Stat5-dependent mechanism. Endocrinology. 2003 May;144(5):1847-53. PubMed PMID: 12697691. 18. NagDas SK, Winfrey VP, Olson GE. Identification of ras and its downstream signaling elements and their potential role in hamster sperm motility. Biol Reprod. 2002 Oct;67(4):1058-66. PubMed PMID: 12297518. 19. Olson GE, Winfrey VP, Blaeuer GL, Palisano JR, NagDas SK. Stage-specific expression of the intermediate filament protein cytokeratin 13 in luminal epithelial cells of secretory phase human endometrium and peri-implantation stage rabbit endometrium. Biol Reprod. 2002 Apr;66(4):1006-15. PubMed PMID: 11906920. 20. Nirodi C, NagDas S, Gygi SP, Olson G, Aebersold R, Richmond A. A role for poly(ADP-ribose) polymerase in the transcriptional regulation of the melanoma growth stimulatory activity (CXCL1) gene expression. J Biol Chem. 2001 Mar 23;276(12):9366-74. Epub 2000 Dec 8. PubMed PMID: 11112786; PubMed Central PMCID: PMC3369623. 21. NagDas SK, Winfrey VP, Olson GE. Identification of a hamster epididymal region-specific secretory glycoprotein that binds nonviable spermatozoa. Biol Reprod. 2000 Nov;63(5):1428-36. PubMed PMID: 11058548. 22. Bedford JM, Mock OB, Nagdas SK, Winfrey VP, Olson GE. Reproductive characteristics of the african pygmy hedgehog, atelerix albiventris. J Reprod Fertil. 2000 Sep;120(1):143-50. PubMed PMID: 11006156.